Seattle must continue fencing off dangerous homeless encampments. Such common-sense moves are needed for safety and to maintain public support for the region’s complex, compassionate and costly response to homelessness. 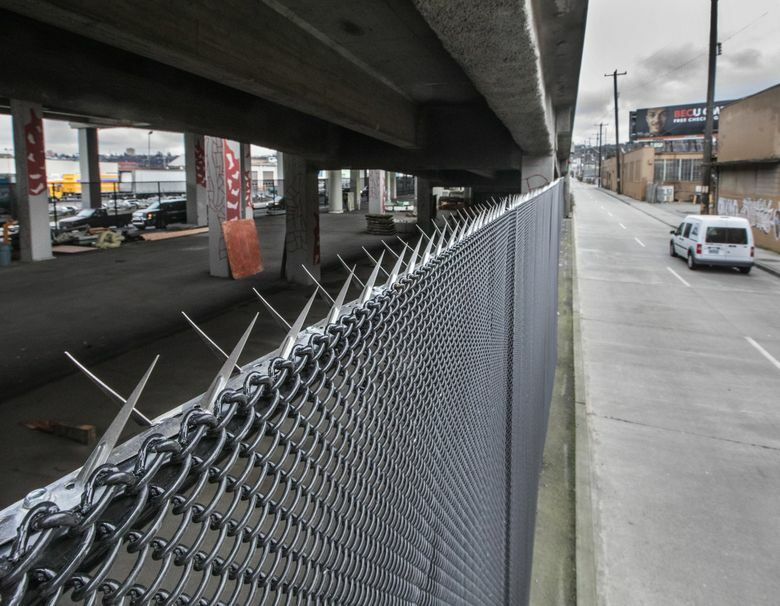 While some Seattle City Council members may dislike fencing off places where homeless campers are causing damage and safety problems, they are far outnumbered by those grateful to see common-sense progress. A Times Project Homeless story last week reported the objections of council members Mike O’Brien and Teresa Mosqueda to fences and bike racks the city used to prevent camping in certain rights of way. They do not speak for the majority. After decades of watching Seattle officials bobble their response, waste millions and allow homelessness to spiral into a humanitarian crisis, patience is growing thin with politicians embracing the status quo. This is not because people don’t care about the plight of people who are displaced and those suffering on the streets. Actually, they care deeply, and are spending heavily to provide care and shelter. Progress is being made. Seattle and King County are demanding better performance from service providers, collecting more data and improving client intake and referral systems. Some suburban cities are increasing shelter capacity. The business community is stepping up with direct support and policy engagement. Most everyone involved knows that caring for these people and this place involves making sometimes difficult choices. One of these choices is clear: Seattle cannot allow encampments to return again and again to places that are dangerous for campers and the public and damaging public property. Council members’ knee-jerk response to fencing oversimplifies the problem. It also disrespects the public, which is becoming more sophisticated in its understanding of the crisis. People realize that the homeless population is not monolithic. It is a range of people facing different crises and responding in different ways to offers of help. Support for this expensive effort and new initiatives around the region will diminish if officials insist on unrealistic responses. The subpopulation of chronically homeless people who resist outreach and relocation efforts, damage public property and create safety problems for themselves and others should be treated differently. Such nuanced responses are more compassionate than blind tolerance. The latter disregards the spectrum of challenges and interventions that are needed. In other words, it is more humane to fence places where people are living in squalor, and endangering themselves and others, than to waste precious time and resources of outreach services going back to these places again and again. Public officials also are obligated to serve the vast majority of constituents who are not homeless. O’Brien made his case at a fenced area beneath the Ballard Bridge. It’s adjacent to bus transfer points where commuters and kids going to school don’t need to be confronted by the sometimes menacing few or those in crisis who persistently return to that location. Fences aren’t cheap. But their cost needs to be weighed against the greater cost of repairing damage that encampments have caused to bridges and viaducts, and to the cost of repeated deployments of fire, police, aid, maintenance and outreach crews to these hot spots. It’s good Mosqueda is taking Seattle’s Department of Transportation to task for “improvements” that inconvenience people using city streets. More can be done in this area. But the problem with these racks was not the city’s intent but its duplicity. The city should improve pedestrian safety and prevent people from dangerously camping on arterials, without pretending it’s doing something else. Addressing safety hazards, protecting public spaces and preserving infrastructure are essential roles of government. Doing so also is a necessary component of the region’s broad, complex and urgent response to homelessness.